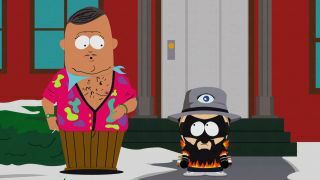 Those mean Sixth Graders are up to their tricks again in South Park: The Fractured But Whole and the situation is anything but 'super' - Big Gay Al's cats have gone missing and it's up to you to rescue them, New Kid. After you've defeated Professor Chaos, go and speak to Big Gay Al outside his house to receive the Scavenger Hunt: Big Gay Al's Big Gay Cats side mission. There are six cats in total to find, and you'll need to use your buddy powers and TimeFarts to collect them all. Track them down and return them to Big Gay Al, to receive some new feline outfits as your reward. By the path leading to Playground, in front of Bijou Theater - use TimeFart Pause to grab Shadow. Fartkour up to the Lofts at SoDoSoPa, collecting Blossom from the end of the plank sticking out on your way up. On a branch in the tree outside Bebe's House - use your firecrackers to break the branch, then use TimeFart Pause to grab Kirby. If the branch is already broken, use TimeFart Glitch to restore it. On a branch in the tree near the Church Fast Travel Flag - use your firecrackers to break the branch, then use TimeFart Pause to grab Bono. Again, if the branch is already broken, use TimeFart Glitch to restore it. Behind a snowdrift to the right of the South Park Mall construction site - use TimeFart Pause to grab Loki. On a branch in the tree next to the path to Canada behind Hillvale Farm - use your firecrackers to break the branch, then use TimeFart Pause to grab Bogie. As before, if the branch is already broken, use TimeFart Glitch to restore it. With all six cats in the bag, return them to Big Gay Al and you'll receive the Feline Costume Set and Snowcat Costume Set, plus Big Gay Al will now pose for a selfie with you to increase that all-important follower count on Coonstagram. Everything is super!